Wildlife researchers are pushing for a more cohesive effort between Malaysia and Indonesia to conserve the critically endangered Sumatran rhino. With fewer than 100 animals left in Sumatra and Borneo, scientists are proposing that the population be managed as a single conservation unit. The Sumatran rhino is found in Sumatra and possibly Kalimantan in Indonesia and Sabah in Malaysia. “Although habitat loss and poaching are reasons for the decline, the reproductive isolation of the mammals, which are too sparsely scattered even within protected areas, is the main threat to the survival of the species,” said wildlife research NGO Borneo Rhino Alliance (BORA) executive director Dr Junaidi Payne. He is the co-author of a paper published this week in the scientific journal Oryx, in which researchers demonstrate the necessity to consider the remaining populations of Sumatran rhinoceros in Sumatra and Borneo as a single conservation unit. The paper was the outcome of a joint study by BORA, the Sabah Wildlife Department, the Department of Wildlife and National Parks, Universiti Malaysia Sabah, Cardiff University and Danau Girang Field Centre (DGFC). DGFC director Dr Benoit Goossens, the paper's lead author, said the genetic differences are minimal and do not justify keeping the Sumatran and Bornean populations as separate management units. 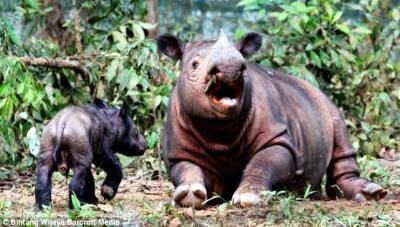 A study of the Javan rhinoceros showed low genetic diversity in that population and there was a critical need for population expansion for the species to survive, Dr Goosens added. Sabah Wildlife Department director Datuk Dr Laurentius Ambu said state authorities are working with researchers. “We understand the need to exchange gametes between Malaysia and Indonesia. “Actions to initiate genome resource banking and artificial insemination or in vitro fertilisation are under way in Sabah and elsewhere,” said Dr Laurentius. He said it is considering sending Tam, a captive male rhinoceros, to Cincinnati Zoo in the United States to breed with a mature female.